Hi, do you stock compatible toner cartridges for an Oki C822 printer please? Regards, Olive. At present, we only stock genuine toner cartridges for use in the Oki C822 colour laser printer. Ideal for businesses in need of a quality colour printer, the Oki C822 colour laser printer can handle a wide variety of print media, best suited for different types of print applications. It can print on A6 as well as A3 media and keeps quality high, thanks to its LED print technology. The Oki C822 LED laser printer is built for high quality graphics printing and it can be used over a network of multiple users. However, the C822 does not have copy or scan capabilities and is not capable of duplex printing, which is reserved for the DN model. 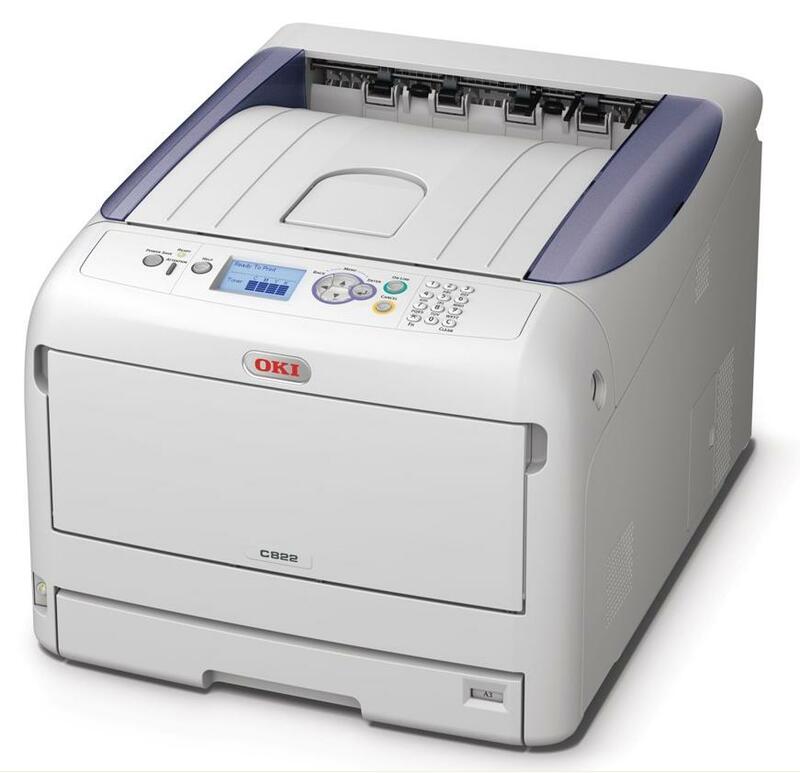 The compact Oki C822 A3 and A4 colour printer measures only about 36x45x55 cm, ideal for desktop use. It can print as many as 1,500 to 5,000 pages per month, which is powerful enough for small to medium offices. It has versatile media handling capabilities, able to process media of different sizes, types, and thickness. The Oki C822 offers USB and Ethernet connectivity, while parallel connectivity comes as an option. It is designed to work with different Windows and Mac operating systems, and it uses LED technology for higher definition printing. In addition to high-quality printing, the Oki C822 A3 colour printer boasts excellent print speeds. The Oki C822 printer can produce as many as 23 coloured pages per minute and it features improved energy efficiency. Fast warm up times promote greater productivity and the machine's paper capacity can further be expanded to 930 sheets for higher volume printing. The Oki C822 printer cartridges are easy to replace and will each print at least 7,000 pages before they need changing. However, the Oki C-822 only offers fine colour printing and cannot support duplexing without the proper upgrade. The C-822 laser printer is only a single function unit but it does its job well when it comes to graphics and photo printing.